Kathe Schaaf has provided leadership in launching numerous innovative collaborative conversations, organizations and communities. As a woman of spirit and faith, you know something important about this moment in history.You know it from your rich experiences in the world, and you know it from a place of deep wisdom within. Your unique pattern of knowing is part of a larger pattern of feminine wisdom being called forth at this time in service of this Earth and of humanity. Women of Spirit and Faith has emerged as a response to this call for a new paradigm of feminine leadership grounded and guided by spirituality. The organization exists to invite all the brilliant threads of feminine spiritual leadership into relationship and to support emerging patterns for transformation. Women Redefining Power in April 2010 and a Young Leaders Retreat in April 2012. 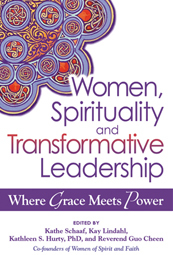 In 2011, WSF published an anthology of women’s spiritual voices Women, Spirituality and Transformative Leadership: Where Grace Meets Power. The new initiative, The Alchemy Project, will build a global alliance to amplify women’s voices. Kathe is a co-founder of Women of Spirit and Faith and serves currently on the leadership circle. The Council for a Parliament of the World’s Religions was created to cultivate harmony among the world’s religious and spiritual communities and foster their engagement with the world and its guiding institutions in order to achieve a just, peaceful and sustainable world. Since 1993, a Parliament of the World’s Religions has convened every five years in a major international city (Chicago 1993, Cape Town 1999, Barcelona 2004, Melbourne 2009). Kathe serves as a Trustee for the Council for a Parliament of the World’s Religions and as co-chair of the Parliament’s Women’s Task Force. Gather the Women is a global network of women and women’s organizations who share a belief that the time is now to celebrate and harvest the incredible power of women’s wisdom on a planetary scale. Kathe was one of 12 women who collaborated to co-created GTW in 2002. Today there are more than 40 Regional Coordinators across the United States as well as International Anchors who invite women locally to gather and co-create. Gather the Women Congresses were held in Canada, Australia and Kenya under Kathe’s leadership in 2006-07. Kathe served on the conveners circle of GTW from 2003-2007. It is time to bring the world back into balance, weaving the feminine principles back into our models for governance and welcoming women into leadership locally and globally. The new paradigm moves us far beyond ‘equality’ to a deep appreciation of feminine values. Kathe facilitated this dialogue which brought men and women together to explore both the challenges and opportunities where gender and power intersect on the path to a new humanity. This dialogue was a collaborative project of Gather the Women – Southern California, the Department of Social Studies and the Department of International Studies at the University of California-Irvine. Co-hosted by two political women leaders in the region, one Democrat and one Republican, the event brought together more than 75 women for a day of dialogue to explore the common ground beyond our political differences. This workshop explored the relationship between feminine spirituality and women’s global leadership. Sovereign means ‘freedom to choose’ … and when a woman can freely choose to follow her divine guidance, a powerful new form of leadership emerges. Kathe guides women on a deeply personal journey to discover their own authentic leadership. Constellations of Hope 2008 brought together 60 women representing 40 diverse North American women’s organizations for three days of dialogue, exploring the opportunities and challenges of collaboration across cultural, spiritual and organizational differences. The gathering was co-convened by Kathe Schaaf (Co-founder Gather the Women), Regina Birchem (Past International President – Women’s International League for Peace and Freedom), Dorothy Ettling (Founder of Women’s Global Connection) and Kathy Sanchez (Tewa Women United); scholarship funding was provided by Kalliopeia Foundation. 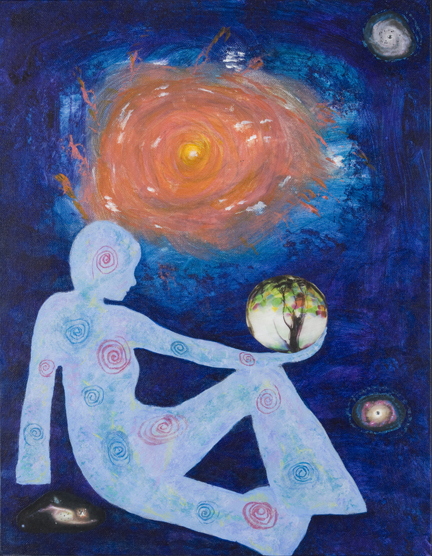 The core circle held the space where we can explore together the many dimensions of the sacred feminine, the healing potential of feminine leadership and new paradigms of collaboration.